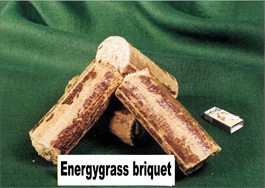 1) The "Szarvasi-1" energygrass as solid fuel. There is increasing importance in using lignocellulose fuels /eg. 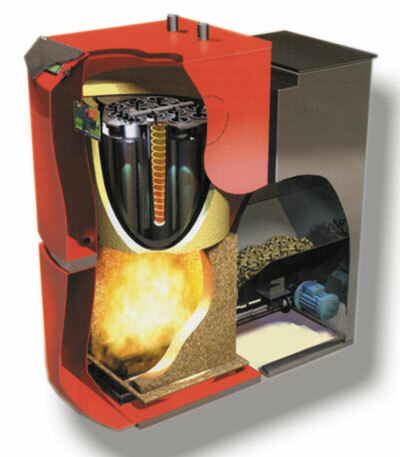 : energyrass/ for heat and electricity supply in Europe and worldwide. Laboratory examinations confirm that the "Szarvasi-1" energygrass has favourable energetical features, because its thermal value approaches or exceeds the thermal value of the national brown coals, wood and straw kinds. 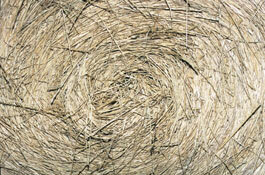 quantity /4,2%/ ash, which can be utiliscd due to its potassium content in the compensation of the soilpower. According to the examinations of the Danish Technological Institute, there was not any softening in case of the ash at 1000 C.
The burning of the energygrass can happen after the appropriate preparation treatments eg. : compression, cutting /baling, briqueting, pelleting/. 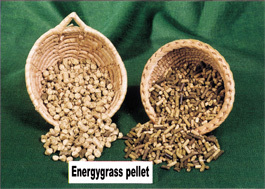 Physical conditioned energy sources can be produced from the different forms of biomass, so from energygrass as well, and they have increasing importance. 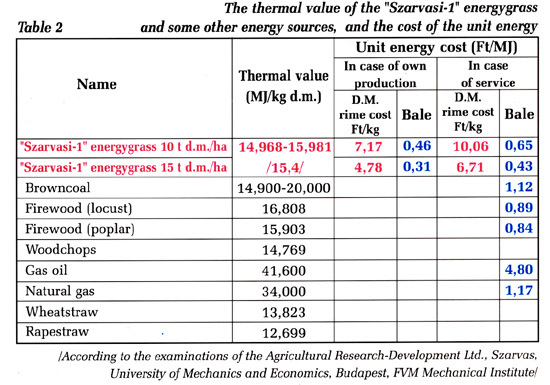 The "Szarvasi-1" energygrass can be one of the cheapest base material of vegetable gas due to its big drymaterial content, favourable material composition, cultivation and harvesting. 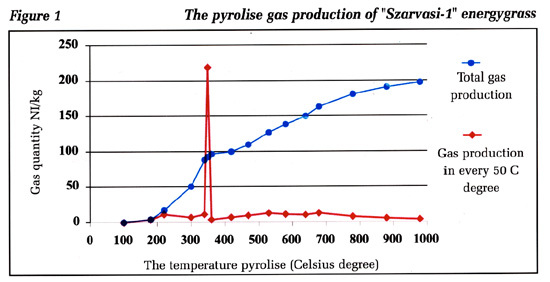 The second peak during the gas production process was detected at 500 and 700 C pyrolise temperature. The detailed results can be seen in Table 4. - Between 550-1000 C the H2 content of gas increases, which will become stable at a very high level. 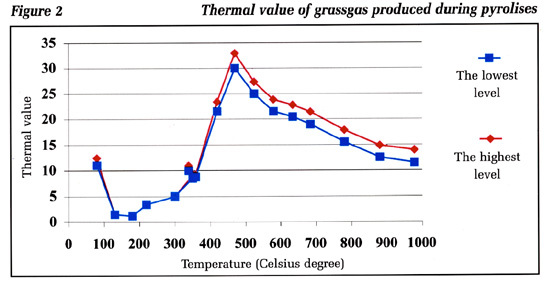 The thermal value produced from "Szarvasi-1" energygrass changes according to the temperature of pyrolise /Figure 2/ The CO2 formation is relatively big at the beginning of pyrolise /250-400 C/, which can reduce the thermal value. The highest thermal value was found at a relatively low 500 C pyrolises temperature. The highest thermal value was 15,1 MJ/Nm3, the lowest was 13,7 MJ/Nm3 with reference to the the total gas production /Table 4/. 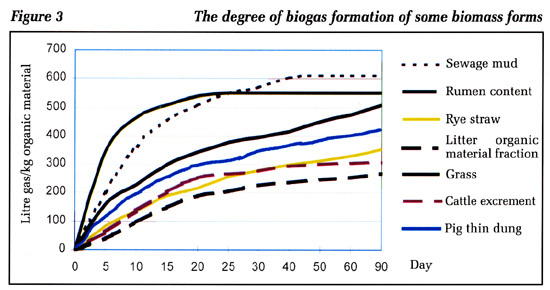 The biogas is the anaerob decomposition of biomass, so it arises as a result of the biological processes. All organic materials are suitable for producing biogas /except the products of the organic chemical industry/. -	Vegetable /except woody-stem plants /energy sources /eg. 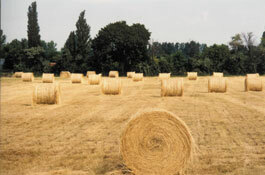 : energy grass/ The biogas contains approximately 60-70 % methan, 30-40 % CO2. The thermal value is 22-23 MJ/Nm3/. The grasses recommended for energetical utilization deserve special attention from the raw materials suitable for biogas production. /Table 3/. 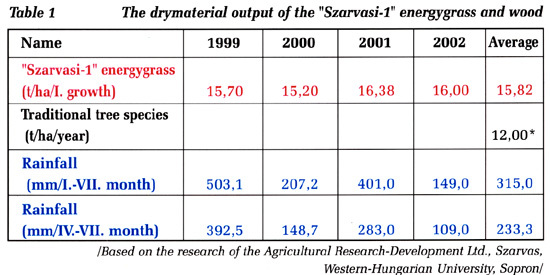 The "Szarvasi-1" energygrass and other perspectivical nominees under improving in their green condition, and mixed with traditional cattle and thin dung, can be utilized for biogas production very efficiently. 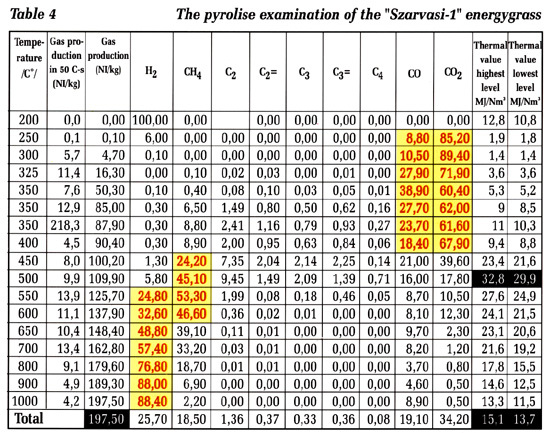 Table 3 demonstrates very well that from the examined biomass forms, the energetically utilizable grasses have the shortest fermentation time, and their gas production is also excellent since the gas quantity produced during the only 15-20 day rotting time exceeded the 0,5 m3/kg dry material order. The use of biogas is wide, the left over material from production can be used for the compensation of soil energy /biodung/. Agricultural Research Development Institute EU.C. 5540 Szarvas, Szabadság út 30. Pf. : 54.